Healthcare Global Enterprises Ltd – The Specialist in Cancer Care extended their growing presence in India, by launching the First Private Comprehensive Cancer Centre in Nagpur today. HCG NCHRI Cancer Centre will house 132 beds and will provide high quality and comprehensive cancer care services. This is the most comprehensive cancer centre in Central India by HCG in collaboration with Nagpur Cancer Hospital and Research Institute (NCHRI). 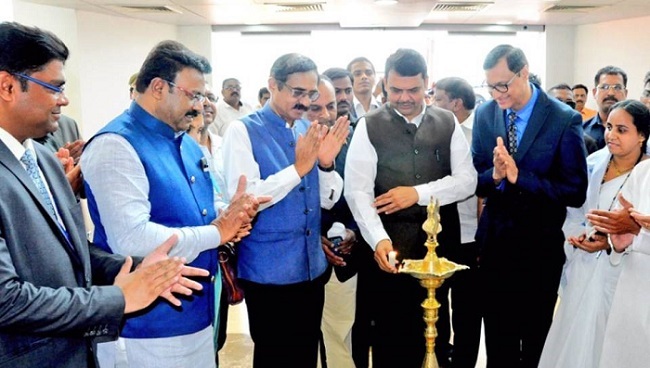 HCG-NCHRI Cancer Centre was inaugurated by Hon’ble Shri Devendra Fadnavis – Chief Minister of Maharashtra on 4th June at 10 am. Post the inauguration, “Cancer Fighter Awards” was given to patients who showed grit, determination, and courage to fight and win the battle against the dreaded disease. On 4th June at 6:30 am, there was a bike rally organized to raise awareness on cancer in Nagpur city. To address the growing need for expertise and quality medical services, HCG NCHRI Cancer Centre will be offering cancer care with multi-disciplinary approach through specialist doctors in Medical, Surgical and Radiation Oncology and a team of experienced clinicians. The cancer center is equipped with the most advanced radiation machine, TrueBeam STx, an innovative medical technology that is capable of significantly faster, more precise, image-guided radio-surgery. Along with TrueBeam, the centre is also equipped with PET CT for planning and diagnosing along with Psycho Oncology and Pathology Lab. The Centre also has Bone Marrow Transplant Unit with 9 beds, the largest in Central India. Healthcare Global Enterprises Ltd (HCG), headquartered out of Bangalore, is the largest provider of cancer care in India. Through its network of 19 comprehensive cancer centres spread across India, HCG has brought advanced cancer care to the doorstep of millions of people. HCG’s comprehensive cancer centres provide expertise and latest technologies in diagnosis and treatment of cancer under one roof. HCG has pioneered introduction and adoption of several technologies in the country and is amongst the first to introduce high-intensity flattening filter free mode radiotherapy, stereotactic radiosurgery and robotic radiosurgery, in the treatment of cancer in India.